All those new wrinkles may not be pretty but they sure are interesting. I’m not a big fan of self portraits but I do a lot of them. They’re a good backup when nobody is available to sit completely still for hours and hours for me. Plus it still beats a landscape — or, zzzzzz….a still life. Here are three self portraits. The one I’m working on, one done in my twenties and a nudie done when I was fifteen. At fifteen I was stacked! or I didn’t get the whole proportions thing yet…. The first image, my favorite, isn’t a self portrait. It’s a drawing my my six year old did of me recently. She’s amazing. If she ever asks, I promise to sit completely still for hours and hours for her. My husband’s business school friend is getting married. He’s a successful guy, one of the producers of THE BOOK OF MORMON. The woman he’s marrying is no slouch either, she’s head of American Art at one of the big auction houses. They collect art and wine. They travel all over. What a couple, right? I wanted to offer to do a portrait but we worried that was presumptuous…I mean how do I know if the head of American art WANTS my work? Still, we are going to offer the portrait and also take them out to dinner — but since they will need to actually sit for the portrait we will give them a funny caricature first as a placeholder. 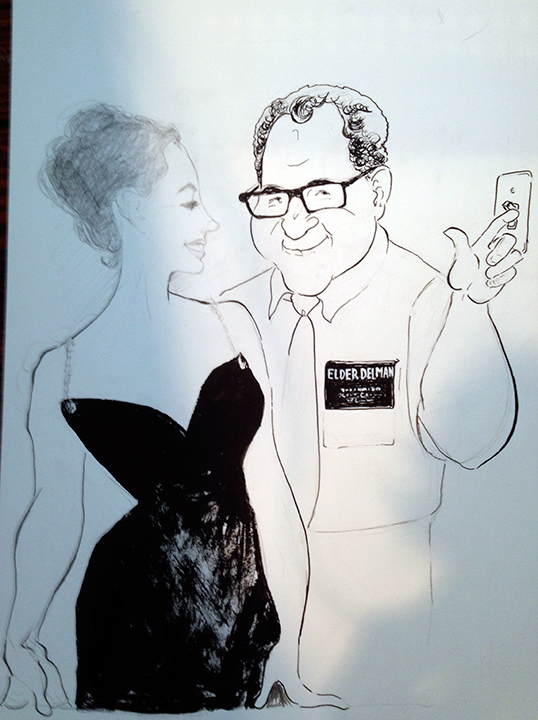 I thought that I could do him as a Mormon Missionary (in the style of Hirschfeld of course since he’s a Broadway guy) and her as Madame X, since she looks like John Singer Sargent’s, Madame X, minus the crazy nose. American art meets American theatre! I have not met her yet so I had to guess from her front view what she looks like from the side (no side views on facebook L) but we meet for dinner tonight so I’d going to show my sketch to them and then see if she’ll let me take a side view. I may need to nix the smile in order to get her Madame X-y enough. I’m going to paint her in too but leave him as a line drawing.